Integrated structural and anisotropy of magnetic susceptibility (AMS) analyses were carried out on the Campanian- Maastrichtian shale-mudstone dominated sedimentary sequences (Haymana Formation) cropping out within the doubly plunging Haymana Anticline in Central Anatolia (Turkey). In order to understand the relationship between the development of magnetofabrics and the tectonic processes, six sites from different parts of the anticline were sampled and analyzed. AMS lineations from 634 cylindrical samples and structural data were collected in the field. The results show very high correlation with the structural trend of the region and indicate that the maximum susceptibility vector (k1) is almost parallel to the Haymana Anticline fold axis (~E-W) and the trace of the Dereköy Thrust Fault, which is the basin-bounding fault at the northern margin of the Haymana Basin. In order to assess the relationship between shortening ratios and obtained AMS vectors, a number of balanced cross-sections are constructed along five traverses almost perpendicular to the axis of the anticline. Results from both the AMS and the balanced cross-sections yielded similar shortening ratios (~18%-32%) that decrease towards the eastern closure of the anticline from its culmination. In a regional sense, we related these results to compressional/transpressional deformation that formed during the Eocene to Early Miocene period. Differential shortening ratios calculated from AMS and restored balanced cross-sections indicate that the shortening is associated with the transcurrent tectonics, possibly in relation with rotational convergence of the Pontides and the Taurides and/or the oblique indentation of the Kırşehir Block into the Pontides during or subsequent to the collision. Allen MB, Ghassemi MR, Shahrabi M, Qorashi M (2003). Accommodation of late Cenozoic oblique shortening in the Alborz range, northern Iran. J Struct Geol 25: 659-672. Averbuch O, Frizon de Lamotte, D, Kissel C (1992). Magnetic fabric as a structural indicator of the deformation path within a fold- thrust structure: a test case from the Corbières (NE Pyrenees, France). J Struct Geol 14: 461-474. Aydemir A (2009). Tectonic investigation of Central Anatolia, Turkey, using geophysical data. J Appl Geophys 68: 321-334. Aydemir A (2011). An integrated geophysical investigation of Haymana Basin and hydrocarbon prospective Kirkkavak Formation in Central Anatolia, Turkey. Petrol Geosci 17: 91- 100. Aydemir A, Ateş A (2006). Structural interpretation of the Tuzgolu and Haymana Basins, Central Anatolia, Turkey, using seismic, gravity and aeromagnetic data. Earth Planets Space 58: 951- 961. Benn K (1994). Overprinting of magnetic fabrics in granites by small strains: numerical modelling. Tectonophysics 233: 153-162. Bilim, F, Ateş A (2007). Identifying block rotations from remanent magnetization effect: example from northern Central Turkey. Earth Planets Space 59: 33-38. Bilim F, Aydemir A, Ateş A (2015). Determination of block rotations and the Curie Point Depths of magnetic sources along the NW– SE-trending Sülüklü-Cihanbeyli-Gölören and Şereflikoçhisar- Aksaray Fault Zones, Central Anatolia, Turkey. Geodin Acta 27: 203-13. Borradaile GJ (1987). Anisotropy of magnetic susceptibility: rock composition versus strain. Tectonophysics 138: 327-329. Borradaile GJ (1988). Magnetic susceptibility, petrofabrics and strain. Tectonophysics 156: 1-20. Borradaile GJ (1991). Correlation of strain with anisotropy of magnetic- susceptibility (AMS). Pure Appl Geophys 135: 15-29. Borradaile GJ, Jackson M (2004). Anisotropy of magnetic susceptibility (AMS): magnetic petrofabrics of deformed rocks. Geol Soc Sp 238: 299-360. Borradaile GJ, Jackson M (2010). Structural geology, petrofabrics and magnetic fabrics (AMS, AARM, AIRM). J Struct Geol 32: 1519- 1551. Borradaile GJ, Mothersill J, Tarling D, Alford C (1986). Sources of magnetic susceptibility in a slate. Earth Planet Sc Lett 76: 336-340. Borradaile G, Tarling DH (1981). The influence of deformation mechanisms on magnetic fabrics in weakly deformed rocks. Tectonophysics 77: 151-168. Bozkurt E (2001). Neotectonics of Turkey - a synthesis. Geodin Acta 14: 3-30. Büyüksaraç A (2007). Investigation into the regional wrench tectonics of inner East Anatolia (Turkey) using potential field data. Phys Earth Planet In 160: 86-95. Büyüksaraç A, Jordanova D, Ateş A, Karloukovski V (2005). Interpretation of the gravity and magnetic anomalies of the Cappadocia Region, Central Turkey. Pure Appl Geophys 162: 2197-2213. Chadima, M, Jelinek V (2009). AniSoft 4.2: Anisotropy Data Browser for Windows. Brno, Czech Republic: AGICO Inc.
Cifelli F, Mattei M, Chadima M, Hirt AM, Hansen A (2005). The origin of tectonic lineation in extensional basins: Combined neutron texture and magnetic analyses on “undeformed” clays. Earth Planet Sc Lett 235: 62-78. Cifelli F, Mattei M, Hirt AM, Günther A (2004). The origin of tectonic fabrics in “undeformed” clays: the early stages of deformation in extensional sedimentary basins. Geophys Res Lett 31: 2-5. Çinku MC (2017). Paleomagnetic results from Northeast Anatolia: remagnetization in Late Cretaceous sandstones and tectonic rotation at the Eastern extension of the Izmir–Ankara–Erzincan suture zone. Acta Geophys 65: 1095-1109. Çinku MC, Hisarli ZM, Yılmaz Y, Ülker B, Kaya N, Öksüm E, Orbay N, Özbey ZÜ (2016). The tectonic history of the Niğde-Kırşehir Massif and the Taurides since the Late Mesozoic: Paleomagnetic evidence for two-phase orogenic curvature in Central Anatolia. Tectonics 35: 772-811. Collinson DW, editor (1983). Methods in Rock Magnetism and Palaeomagnetism. Paleomagnetism-Techniques and Instrumentation. 1st ed. London, UK: Springer Science & Business Media. Cox A, Doell RR (1960). Review of paleomagnetism. Geol Soc Am Bull 71: 645-768. Dahlstrom CDA (1969). Balanced cross sections. Can J Earth Sci 6: 743- 757. Dilek Y (2006). Collision tectonics of the Mediterranean region: causes and consequences. Geol S Am S 409: 1-14. Evans MA, Lewchuk MT, Elmore RD (2003). Strain partitioning of deformation mechanisms in limestones: examining the relationship of strain and anisotropy of magnetic susceptibility (AMS). J Struct Geol 25: 1525-1549. Fabian K, Shcherbakov VP, McEnroe SA (2013). Measuring the Curie temperature. Geochem Geophy Geosy 14: 947-961. Görür N, Oktay FY, Seymen I, Şengör AMC (1984). Palaeotectonic evolution of the Tuzgölü basin complex, Central Turkey: sedimentary record of a Neo-Tethyan closure. Geol Soc Sp 17: 467-482. Görür N, Tüysüz O, Şengör AMC (1998). Tectonic evolution of the Central Anatolian basins. Int Geol Rev 40: 831-850. Gülyüz E (2015). Tectono-stratigraphic and thermal evolution of the Haymana Basin, Central Anatolia, Turkey. PhD, Middle East Technical University, Ankara, Turkey. Gürer D, Hinsbergen DJJ, Matenco L, Corfu F, Cascella A (2016). Kinematics of a former oceanic plate of the Neotethys revealed by deformation in the Ulukışla basin (Turkey). Tectonics 35: 2385- 2416. Hirt AM, Evans KF, Engelder T (1995). Correlation between magnetic anisotropy and fabric for Devonian shales on the Appalachian Plateau. Tectonophysics 247: 121-132. Hisarlı ZM, Çinku MC, Ustaömer T, Keskin M, Orbay N (2016). Neotectonic deformation in the Eurasia–Arabia collision zone, the East Anatolian Plateau, E Turkey: evidence from palaeomagnetic study of Neogene–Quaternary volcanic rocks. Int J Earth Sci 105: 139-65. Housen BA, Kanamatsu T (2003). Magnetic fabrics from the Costa Rica margin: sediment deformation during the initial dewatering and underplating process. Earth Planet Sc Lett 206: 215-228. Housen BA, Richter C, van der Pluijm BA (1993). Composite magnetic anisotropy fabrics: experiments, numerical models and implications for the quantification of rock fabrics. Tectonophysics 220: 1-12. Housen BA, van der Pluijm BA (1991). Slaty cleavage development and magnetic anisotropy fabrics. J Geophys Res 96: 9937-9946. Hrouda F (1982). Magnetic anisotropy of rocks and its application in geology and geophysics. Geophys Surv 5: 37-82. Hrouda F (1991). Models of magnetic anisotropy variations in sedimentary thrust sheets. Tectonophysics 185: 203-210. Hrouda F (1993). Theoretical models of magnetic anisotropy to strain relationship revisited. Phys Earth Planet In 77: 237-249. Hrouda F, Janak F (1976). The changes in shape of the magnetic susceptibility ellipsoid during progressive metamorphism and deformation. Tectonophysics 34: 135-148. Hrouda F, Krejci O, Potfaj M, Stranik Z (2009). Magnetic fabric and weak deformation in sandstones of accretionary prisms of the Flysch and Klippen Belts of the Western Carpathians: mostly offscraping indicated. Tectonophysics 479: 254-270. Huang W, Dupont-Nivet G, Lippert PC, van Hinsbergen DJJ, Hallot E (2013). Inclination shallowing in Eocene Linzizong sedimentary rocks from southern Tibet: correction, possible causes and implications for reconstructing the India-Asia collision. Geophys J Int 194: 1390-1411. Jelinek V, editor (1977). The Statistical Theory of Measuring Anisotropy of Magnetic Susceptibility of Rocks and Its Application. 1st ed. Brno, Czechoslovakia: Geofyzika Brno. Jelinek V (1978). Statistical processing of magnetic susceptibility measured on groups of specimens. Stud Geophys Geod 22: 50-62. Jelinek V (1981). Characterization of the magnetic fabric of rocks. Tectonophysics 79: 63-67. Kaymakcı N, Özçelik Y, White SH, Van Dijk PM (2009). Tectono- stratigraphy of the Çankırı Basin: late Cretaceous to early Miocene evolution of the Neotethyan suture zone in Turkey. Geol Soc Sp 311: 67-106. Ketin I (1966). Tectonic units of Anatolia (Asia Minor). Min Res Exp Bull 66: 23-34. Kissel C, Laj C, Lehman B, Labyrie L, Bout-Roumazeilles V (1997). Changes in the strength of the Iceland–Scotland Overflow Water in the last 200,000 years: evidence from magnetic anisotropy analysis of core SU90-33. Earth Planet Sc Lett 152: 25-36. Kissel C, Laj C, Poisson A, Savascin Y, Simeakis K, Mercier, JL (1986). Paleomagnetic evidence for Neogene rotational deformations in the Aegean domain. Tectonics 5: 783-796. Koçyiğit A (1991). An example of an accretionary forearc basin from northern Central Anatolia and its implications for the history of subduction of Neo-Tethys in Turkey. Geol Soc Am Bull 103: 22-36. Lefebvre C, Meijers MJM, Kaymakcı N, Peynircioğlu A, Langereis CG, van Hinsbergen DJJ (2013). Reconstructing the geometry of central Anatolia during the late Cretaceous: large-scale Cenozoic rotations and deformation between the Pontides and Taurides. Earth Planet Sc Lett 366: 83-98. Lowrie W (1989). Magnetic analysis of rock fabric. In: James DE, editor. Encyclopedia of Solid Earth Geophysics. 1st ed. Boston, MA, USA: Springer, pp. 698-706. Mattei M, Sagnotti L, Faccenna C, Funiciello R (1997). Magnetic fabric of weakly deformed clay-rich sediments in the Italian peninsula: relationship with compressional and extensional tectonics. Tectonophysics 271: 107-122. Mattei M, Speranza F, Argentieri A, Rossetti F, Sagnotti L, Funiciello R (1999). Extensional tectonics in the Amantea basin (Calabria, Italy): a comparison between structural and magnetic anisotropy data. Tectonophysics 307: 33-49. McClay KR, Whitehouse PS, Dooley, T, Richards M (2004). 3D evolution of fold and thrust belts formed by oblique convergence. Mar Petrol Geol 21: 857-877. McClusky S, Balassanian S, Barka A, Demir C, Ergintav S, Georgiev I, Gurkan O, Hamburger M, Hurst K, Kahle H et al. (2000). GPS constraints on plate motion and deformation in the eastern Mediterranean: implications for plate dynamics. J Geophys Res 105: 5695-5719. Meijers MJM, Kaymakcı N, Van Hinsbergen DJJ, Langereis CG, Stephenson RA, Hippolyte J (2010). Late Cretaceous to Paleocene oroclinal bending in the central Pontides (Turkey). Tectonics 29: 1-21. MTA (2002). Geological Map of Turkey (Scale 1:500,000). Ankara, Turkey: General Directorate of Mineral Research and Exploration of Turkey (MTA). Mullender TAT, Van Velzen AJ, Dekkers MJ (1993). Continuous drift correction and separate identification of ferrimagnetic and paramagnetic contribution in thermomagnetic runs. Geophys J Int 114: 663-672. Nairn SP, Robertson AHF, Ünlügenç UC., Tasli K, İnan N (2013). Tectonostratigraphic evolution of the Upper Cretaceous–Cenozoic central Anatolian basins: an integrated study of diachronous ocean basin closure and continental collision. Geol Soc Sp 372: 343-384. Noltimier HC (1971). Magnetic rock cylinders with negligible shape anisotropy. J Geophys Res 76: 4035-4037. Okay AI (2008). Geology of Turkey: a synopsis. Anschnitt 21: 19-42. Okay AI, Altiner D (2016). Carbonate sedimentation in an extensional active margin: Cretaceous history of the Haymana region, Pontides. Int J Earth Sci 105: 2013-2030. Okay AI, Harris NBW, Kelley SP (1998). Exhumation of blueschists along a Tathyan suture in northwest Turkey. Tectonophysics 285: 275-299. Okay AI, Tüysüz O, Satır M, Özkan-Altıner S, Altıner D, Sherlock S, Eren RH (2006). Cretaceous and Triassic subduction-accretion, HP/LT metamorphism and continental growth in the Central Pontides, Turkey. Geol Soc Am Bull 118: 1247-1269. Oliva-Urcia B, Rahl JM, Schleicher AM, Pares JM (2010). Correlation between the anisotropy of the magnetic susceptibility, strain and X-ray texture goniometry in phyllites from Crete, Greece. Tectonophysics 486: 120-131. Owens WH (1974). Mathematical model studies on factors affecting the magnetic anisotropy of deformed rocks. Tectonophysics 24: 115- 131. Özkaptan M (2016). Post-Late Cretaceous rotational evolution of Neotethyan sutures around Ankara Region. PhD, Middle East Technical University, Ankara, Turkey. Özkaptan, M, Kaymakci, N, Langereis CG, Gülyüz, E, Özacar A, Uzel B, Sözbilir H (2018). Age and kinematics of the Burdur Basin: Inferences for the existence of the Fethiye Burdur Fault Zone in SW Anatolia (Turkey). Tectonophysics 744: 256-274. Özsayin E, Dirik K (2011). The role of oroclinal bending in the structural evolution of the Central Anatolian Plateau: evidence of a regional changeover from shortening to extension. Geol Carpath 62: 345- 359. Pares JM, van der Pluijm BA (2002). Phyllosilicate fabric characterization by low-temperature anisotropy of magnetic susceptibility (LT- AMS). Geophys Res Lett 29: 68. Pares JM, van der Pluijm BA (2003). Magnetic fabrics and strain in pencil structures of the Knobs Formation, Valley and Ridge Province, US Appalachians. J Struct Geol 25: 1349-1358. Pares JM, van der Pluijm BA (2004). Correlating magnetic fabrics with finite strain: Comparing results from mudrocks in the Variscan and Appalachian Orogens. Geol Acta 2: 213-220. Pares JM, van der Pluijm BA, Dinares-Turell J (1999). Evolution of magnetic fabrics during incipient deformation of mudrocks (Pyrenees, northern Spain). Tectonophysics 307: 1-14. Passier HF, de Lange GJ, Dekkers MJ (2001). Magnetic properties and geochemistry of the active oxidation front and the youngest sapropel in the eastern Mediterranean sea. Geophys J Int. 145: 604-614. Perez-Caceres I, Simancas JF, Martinez Poyatos D, Azor A, Gonzalez Lodeiro F (2016). Oblique collision and deformation partitioning in the SW Iberian Variscides. Solid Earth 7: 857-872. Piper JD, Gürsoy H, Tatar O, Beck ME, Rao A, Koçbulut F, Mesci BL (2010). Distributed neotectonic deformation in the Anatolides of Turkey: a palaeomagnetic analysis. Tectonophysics 488: 31-50. Pourteau A, Candan, O, Oberhansli R (2010). High-pressure metasediments in central Turkey: constraints on the Neotethyan closure history. Tectonics 29: 1-18. Pourteau A, Sudo M, Candan O, Lanari P, Vidal O, Oberhansli R (2013). Neotethys closure history of Anatolia: insights from 40Ar-39Ar geochronology and P-T estimation in high-pressure metasedimentary rocks. J Metamorph Geol 31: 585-606. Ramsay JG, editor (1967). Folding and Fracturing of Rocks. 1st ed. Caldwell, NJ, USA: Blackburn Press. Richter C (1992). Particle motion and the modelling of strain response in magnetic fabrics. Geophys J Int 110: 451-464. Robion P, Grelaud S, Frizon de Lamotte D (2007). Pre-folding magnetic fabrics in fold-and-thrust belts: why the apparent internal deformation of the sedimentary rocks from the Minervois basin (NE - Pyrenees, France) is so high compared to the Potwar basin (SW - Himalaya, Pakistan)? Sediment Geol 196: 181-200. Rochette P (1987). Magnetic susceptibility of the rock matrix related to magnetic fabric studies. J Struc Geol 9: 1015-1020. Rochette P, Jackson M, Aubourg C (1992). Rock magnetism and the interpretation of anisotropy of magnetic susceptibility. Rev Geophys 30: 209-226. Rojay B (2013). Tectonic evolution of the Cretaceous Ankara Ophiolitic Mélange during the Late Cretaceous to pre-Miocene interval in Central Anatolia, Turkey. J Geodyn 65: 66-81. Sagnotti L, Faccenna C, Funiciello R, Mattei M (1994). Magnetic fabric and structural setting of Plio–Pleistocene clayey units in an extensional regime: the Tyrrhenian margin of central Italy. J Struc Geol 16: 1243-1257. Sagnotti L, Mattei M, Faccenna C, Funiciello R (1994). Paleomagnetic evidence for no tectonic rotation of the central Italy Tyrrhenian Margin since Upper Pliocene. Geophys Res Lett 21: 481-484. Sagnotti L, Speranza F, Winkler A, Mattei M, Funiciello R (1998). Magnetic fabric of clay sediments from the external northern Apennines (Italy). Phys Earth Planet Int 105: 73-93. Sagnotti L, Winkler A, Montone P, Di Bella L, Florindo F, Mariucci MT, Frepoli A (1999). Magnetic anisotropy of Plio-Pleistocene sediments from the Adriatic margin of the northern Apennines (Italy): implications for the time-space evolution of the stress field. Tectonophysics 311: 139-153. Sanver, M, Ponat E (1981). Kırşehir ve dolaylarına ilişkin paleomanyetik bulgular, Kırşehir Masifinin rotasyonu. İstanbul Yerbilimleri 2: 231-238 (in Turkish). Scriba H, Heller F (1978). Measurements of anisotropy of magnetic susceptibility using inductive magnetometers. J Geophys 44: 341- 352. Şengör AMC, Yılmaz Y (1981). Tethyan evolution of Turkey: a plate tectonic approach. Tectonophysics 75: 181-241. Şengör AMC, Yilmaz Y, Ketin I (1980). Remnants of a pre-Late Jurassic ocean in northern Turkey: fragments of Permian-Triassic Paleo- Tethys? Geol Soc Am Bull 91: 599-609. Soto R, Larrasoana JC, Arlegui LE, Beamud E, Oliva-Urcia B, Simon JL (2009). Reliability of magnetic fabric of weakly deformed mudrocks as a palaeostress indicator in compressive settings. J Struct Geol 31: 512-522. Tarling DH, Hrouda F, editors (1993). The Magnetic Anisotropy of Rocks. 1st ed. London, UK: Chapman and Hall. Tripathy NR (2009). Degree of magnetic anisotropy as a strain-intensity gauge in a saturated finite-strain zone. J Geol Soc London 166: 9-12. Ünalan G, Yüksel V, Tekeli T, Gönenç O, Seyirt Z, Hüseyin S (1976). The stratigraphy and palaeogeographical evolution of the Upper Cretaceous–Lower Tertiary sediments in the Haymana-Polatlı region (SW of Ankara). Bulletin of the Geological Society of Turkey 19: 159-176. Uygun A (1981). Tuz Gölü havzasmin jeolojisi, evaporit, oluşumlan ve hidrokarbon olanaklan. In: Doğan P, editor. 35th Scientific and Technical Congress of the Geological Society of Turkey. Central Anatolia Geology Symposium Proceedings, pp. 68-71 (in Turkish). van Hinsbergen DJJ, Maffione M, Plunder A, Kaymakcı N, Ganerod M, Hendriks BWH, Peters K (2016). Tectonic evolution and paleogeography of the Kırşehir Block and the Central Anatolian Ophiolites, Turkey. Tectonics 35: 983-1014. Woodcock NH (1977). Specification of fabric shapes using an eigenvalue method. Bull Geol Soc Am 88: 1231-1236. Yüksel S (1970). Etude géologique de la région d’Haymana (Turquie Centrale). PhD, l’Universite de Nancy, Nancy, France (in French). ISNAD ÖZKAPTAN, Murat , GÜLYÜZ, Erhan . "Relationship between the anisotropy of magnetic susceptibility and development of the Haymana Anticline, Central Anatolia (Turkey)". 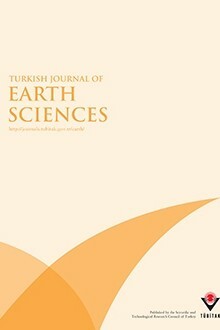 Turkish Journal of Earth Sciences 28 / 1 (January 2019): 103-121.